9mm 115 gr. LSWC Bullets? Anyone make 9mm 115 gr. LSWC bullets besides Penn? Nothing against Penn, just looking for alternatives. Re: 9mm 115 gr. LSWC Bullets? I think what you mean is,is there anyplace you don't have to buy them 500 at a time? I have been thinking about contacting Bob and seeing if I can get 1000 bullets but a real mix of calibers. I want a couple hundred of the 9s but also some 38 ( 2 types), 41 and 45 cal. But I don't really want to have to buy 2500 bullets to test them. I will let you know if that works with Penn. I don't mind buying 500, that's how many I had in mind. I was just looking for another source. So far I haven't found one. Ideally, I wish Magnus made these so I could combine that with my next order of .45 ACP 185 LSWCs, which I really like. Nope. Other than casting your own, I don't know. I do know that the old MasterBlaster coated 115 gn L-SWCs were fantastic. If I had any idea they were closing years ago, I would have tried to buy 10k or more. Penn is my source. 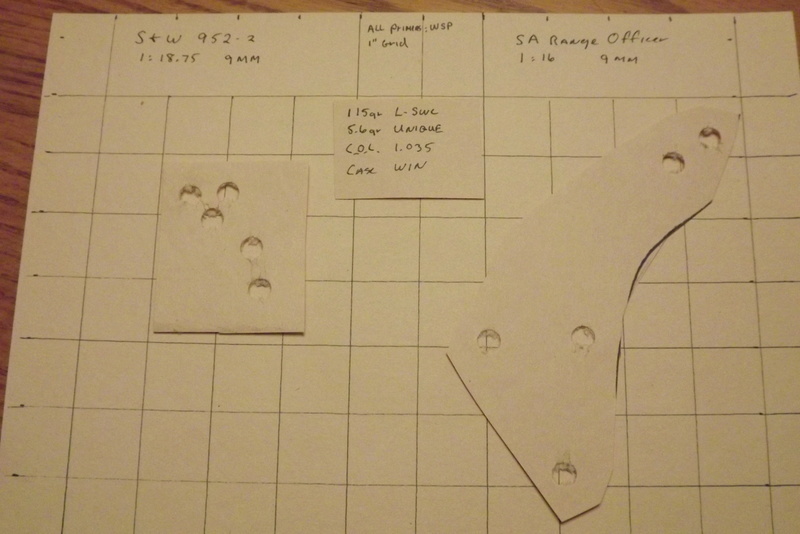 I get them 0.357"
I need a bullet mold design number or maker to see about producing these 9mm swc. Magnusbullets wrote: I need a bullet mold design number or maker to see about producing these 9mm swc. I don't know anything about bullet molds but Penn's website states that their 9mm 115g SWC is patterned after the H&G 68 SWC. Please let us know if you plan to make them. Will do. Mold set expensive. Take some time to have them made. Have to justify possible orders versus investment. Wanted a swc for 9mm long time. We have a 130 gr that works good. Just heavy for some shooters. SAECO #925 115 grain LSWC mold. Also, check out the SAECO #922, sort of a round nose SWC. 124 grain mold would be SAECO #924. I was not able to find the 130gr 9's on your site. They sound interesting to me. My pistol likes heavier bullets. Can you provide a link to their location? They are part no. 509 in 38 section. Some shoot .357 in 9mn can size smaller. Original use was light ppc revolver loads. I shoot the Lee 105 LSWC in my 9mm 1911 and my everday 9's. They shoot pretty well. My lead mix has them dropping out of the mold at 108-110gn and .358. I size them down to .357. Brettitt41 wrote: I shoot the Lee 105 LSWC in my 9mm 1911 and my everday 9's. They shoot pretty well. My lead mix has them dropping out of the mold at 108-110gn and .358. I size them down to .357. Brettitt41 wrote: They shoot pretty well. >11" at 25 yards with 5.4-5.9gn 231/HP38. is this from a 9mm 1911? Has anybody worked out specific loads for 115g LSWC or 122gr?? I would like to use them for 25 yard practice. 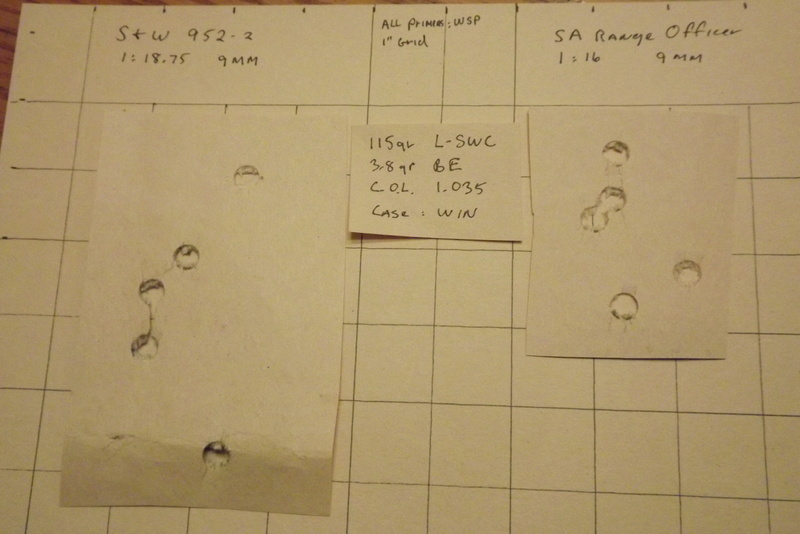 robert84010 wrote: Has anybody worked out specific loads for 115g LSWC or 122gr?? I would like to use them for 25 yard practice. I have 500 of the Penn 115gr coming. Just got notice they shipped. I will be testing a lot of different loads shortly (weather permitting). My local shop had Tightgroup, bluedot and WST on the shelve this morning. Now I have even more powders to test. I load them to abt 1500 fps in my .357 sig barrel....LOTS of noise but reasonable recoil. I was looking for some load information on the Penn 115gr. LSWC, Mr. Google brought me to this thread. Were you successful in developing a decent performing load for this bullet? I need to shoot lead at the indoor range I frequent. Made me look. I have went to almost all jacketed bullets since this post. I have two pictures that show the best and the worst of this bullet. The load really makes a huge difference for the same bullet with different twist barrels. I was testing this bullet in my 952 and a 9mm RO. Notice how the group changed. 952 likes it hot. RO likes it mild. They can work nice for the short line but you have to find the right load for your pistol. 4.2 gr of WST with a Dardas 126 gr lead, works good for me with both my 1911's and M&P 5". I actually like 4.1 gr a little better, but doesn't always reliably function in my M&P. If I remember correctly, FPS with 4.2 gr from my Wesson 1911 was about 1070 fps.